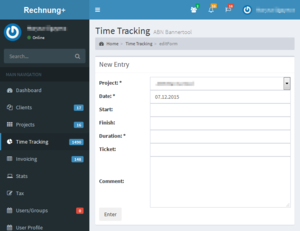 Rechnung+ is a web-tool for keeping track of the time spent on some work and making bills for it. It is completely free for freelancers. 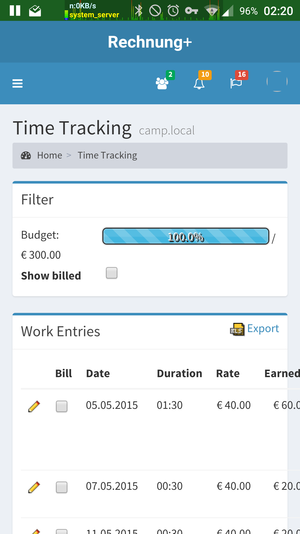 It allows you to enter the time (as interval or duration) which you have spent on any work. You can categorize the work into projects. You can relate your work to a ticket - effectively grouping several work inside one project. It allows you to make invoices for any subset of the work entered in the system. The calculation of the bills total time and money (taking care of VAT) will be done automatically. The invoices can be printed or saved into PDFs. A powerful statistical report generator will help you to analyze the work you did by time or money, grouping work by day, week, month or year, comparing selected projects to each other. For every report you generate graphical chart will be generated automatically - visualizing the information and making it easier to perceive. Read below for a detailed description or try our demo account (no registration required). 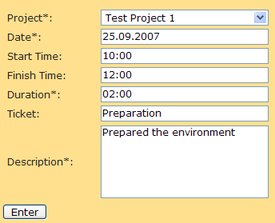 Tracking the time requires you to enter each work-duration in the database by using a simple form. Each work is related to a project ("Test Project 1" in this case). Start and finish time may not be entered, only the actual duration is taken into account. Ticket field allows you to group several works into freely-choosable categories. These categories can be shown in the bill together with the time spent and money charged for each of them. Description is solely for your own information. Clicking on the icon will open the work-editing form when you can modify every field. You can even change the project thus moving incorrectly entered work from one project to another. Clicking on icon will delete the corresponding work. On this example picture you can also see that Rechnung+ allows you to override the automatic duration calculation. But, in the same time, it is indicating such case with red "(03:00)". In the list of work checkboxes next to the icon allow you to choose for which works the invoice should be made. Selecting one or more and then clicking on [Make Invoice] button will calculate the total time for selected work and show it in the form. You may add the invoice comment and click on [Enter] to save it. Your newly created invoice will look similar to this one. There are several templates you can use which will not only change the way your invoice is looking like, but also enable or disable some of the invoice features. One of the features allows you to split the total time and money of the invoice into correcponding categories (called tickets). This way you can make multiline invoice with detailed breakdown of each category. You can keep track of the dates when your invoces are payed. This information can be used in statistical reports. Rechnung+ keeps the history of your data forever. You can run numerous statistical reports. You can calculate the time/money per day/week/month/year. For a specific time range. Or you can split the report per project, which allows you to compare several projects to each other (in terms of time or money). Try out Rechnung+ with our demo account (no registration required). Or just give it a try yourself, registration will only take three minutes. Please don't hesitate to ask questions regarding the system. We are glad to help. Your feedback is very important for us! Knowing what you personally like or dislike about Rechnung+ will help us to improve the service. Please tell us if you are missing a feature - nice features will be given highest priority. This project is free for you, but we have spent a lot of time making it most conveniet for you. Please donate. Rechnung+ is a product of the process of the ongoing improvement. We welcome your comments and suggestions. Make a Firefox plugin for faster time-tracking without opening Rechnung+ page (developers are welcome). Generate PDFs from the invoices. Export time-tracking records into Excel. Adjust Rechung+ page for iPhone. What other feature would you like? Have you checked an Android app for Rechnung+. Do you like the service of Rechnung+? Please donate.